Tucson - Day 6 - Pearls!!! 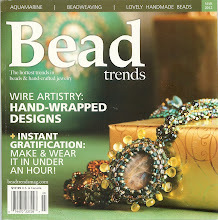 Today we hit two retail oriented shows - Tucson Bead Show and To Bead True Blue. I did check out the Craftoptics magnifying glasses and they are quite cool. Buying them will have to wait though - since my budget is expended in beads and gems right now ... 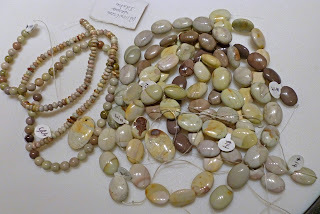 I found some beautiful ceramic beads and drops - didn't take a single picture - aagghh! And I'm too tired to dig out the company name right now. All I did at this show was get information about wholesale pricing and examine their products. The boss did let her take a picture of me with the sea of pearls in the background. From Lucky Gems it was off to GJX with time to visit only one vendor. Since I wanted to make sure I got some of the remaining sterling silver stock from Ezel Findings I went there first. I finally got to meet Sun Young in person! Yay! Did I take a picture? No ... Booo!!! I was glad she still has some of her old sterling silver stock. Because of cost they are switching to plated brass ... wah! We saw him on day 3 and he's at the Kino Gem and Mineral Show (aka TEP). He has some friends that are for sale as well. Today we stopped by the GIGM Grant Inn show on the way to the Arizona/Sonora Desert Museum. I was quite disappointed at the show. Triveni, which used to sell nice sterling, now only sells cheap stuff. Needless to say they are off my list of vendors to see. 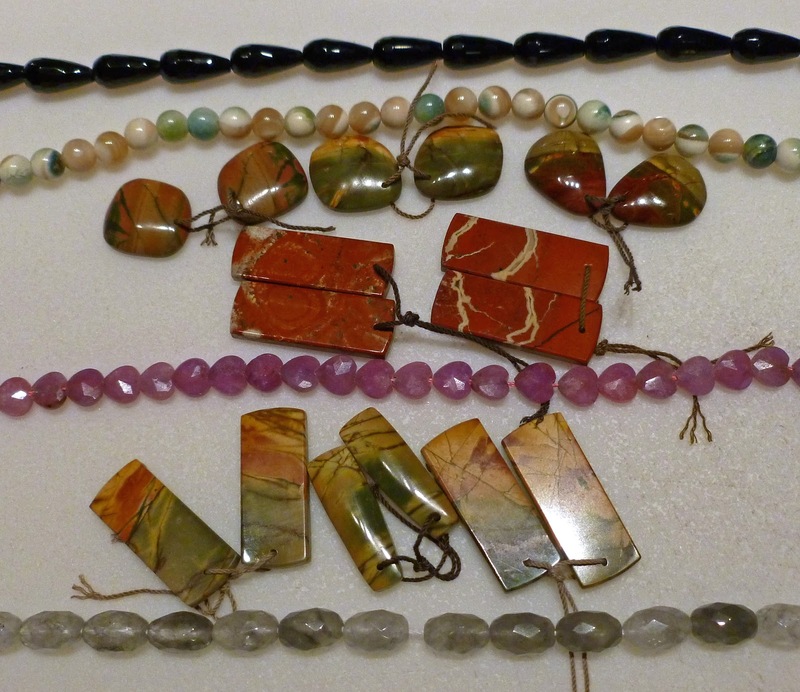 The rest of the stuff was a lot of import $1-$3 beads, African creations and beads and, of course, already made jewelry. Nothing that I got excited about. I think he wants to know what the heck I'm looking at ... The prarie dogs are always fun to watch! We had lunch at the restaurant inside the museum and it was quite good. And this one dessert was easily shared by all 3 of us. Doesn't it look delish? Next it was back to TEP (aka the Kino Gem and Mineral show) and another of my favorite gemstone suppliers - Royal Quality Gems - owned by Chun and Jennifer Ho. 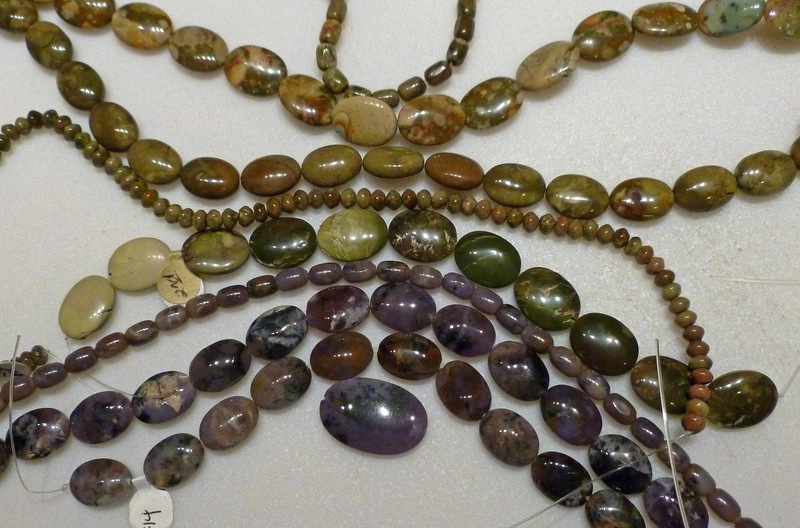 They always have wonderful, quality gemstones at very reasonable prices. I had a good time shopping there. The pictures only show the gems that actually photographed well since I didn't want to remove them from their protective sleeves. Gorgeous turquoise and oh-so-hard-to-find river stone! 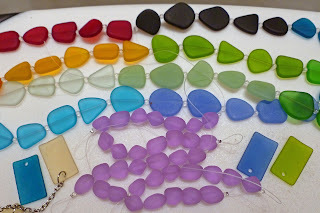 ﻿From here we next headed back to G&LW Gem Mall to replace some cultured sea glass (aka manmade sea glass) at Znet that Kathy accidently dropped and to go in search of faceted, skinny, but not too long onyx drops. Here is some of the manmade sea glass I purchased yesterday and today at Znet - I love it! And that, my friends, was that. We headed back to the condo, Kathy, my kitchen beautician, colored my hair to turn some of that blondie-grey into just blondie ... And now it's time to hit the sack. More on our adventures tomorrow! Day 2 we got a bit of a late start but we began the day at the Pueblo Gem and Mineral Show. Me at Yaushing Gems - I did not get this gals name - bad me! The first person I visit at JG&M and usually on the first day of the show is Toyo Feng. 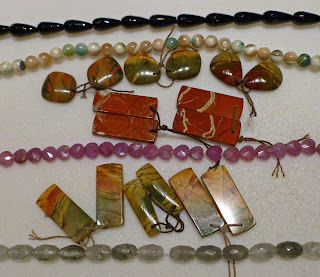 Feng's Trading has beautiful gemstones at fair prices. I got some beautiful green pyrite - and bought almost all he had it was so cool looking! and more ... I love the micanite purple, green and flashes of mica! ﻿Today was day 3 and we visited Toyo again, then briefly went through TEP (Tucson Electric Park aka Kino Gem and Mineral Show) looking for my favorite tool maker, Miland Seuss. He was not there - I hope he's OK! Then we tagged along with another jeweler friend to the back of TEP to the RV Park show. We've never been to that and we had a blast. I totally forgot to take pictures but we'll be heading back there tomorrow. I wore my college roomie out so she hung at the condo today. Meanwhile my mom is still going strong with me to the shows! Yay Mom! Beautiful turquoise from the Nevada Turquoise Co - one of my first visits when I arrive in Tucson! And more turquoise from Nevada Turquoise Co!